New to the Sky Hook precision lifting device product line-up, the A8770 Sky Hook with Mobile Cart Base and Articulating Arm reaches further and offers more versatility than any other Sky Hook. Small, portable, ergonomic lifting devices are what manufacturer Syclone ATTCO Service has been building for nearly 50 years. With a complete, well rounded product line offering everything from tool post mounted Sky Hooks to fully customized mobile lifting solutions, the Sky Hook has quickly become the lifting companion that companies all over the world are turning to in-order-to solve their specific lifting needs. The Model A8770 Sky Hook with Mobile Cart Base and Articulating Arm, as well as the other articulating arm Sky Hook models are the product of Sky Hook’s continued mission to meet the ever-changing needs of today’s unique work environment. These models have a 36” total reach shared between the Sky Hook and the articulating arm, each with its own ability to rotate a full 360 degrees. This added hinge point allows the load to be picked from nearly anywhere within the Sky Hook’s 36” diameter range of motion. While a typical lifting device with a single pivot point is trapped within its rotational arc, the articulating arm Sky Hooks are free to move wherever and however is needed. 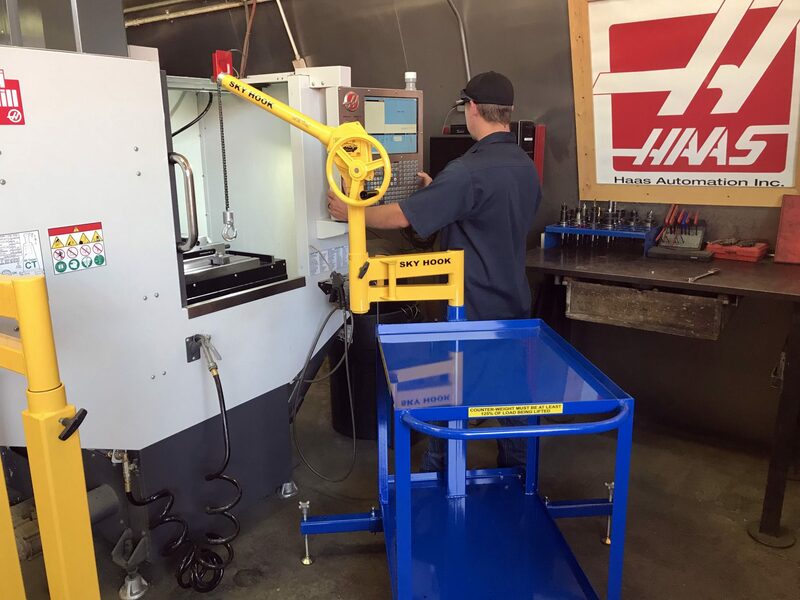 This has proven to be of great benefit for customers with tight working conditions, load positioning in machine cabinets, and fixed base applications. The Sky Hook is an ergonomic, manual lifting device that does not require connection to electricity, air or hydraulics. It’s clean, simple and easy to operate. With most Sky Hook models having a maximum capacity of 500 lbs., a single person can do what once took up to four people, saving time and money. All Sky Hook models can be customized to best fit the application.